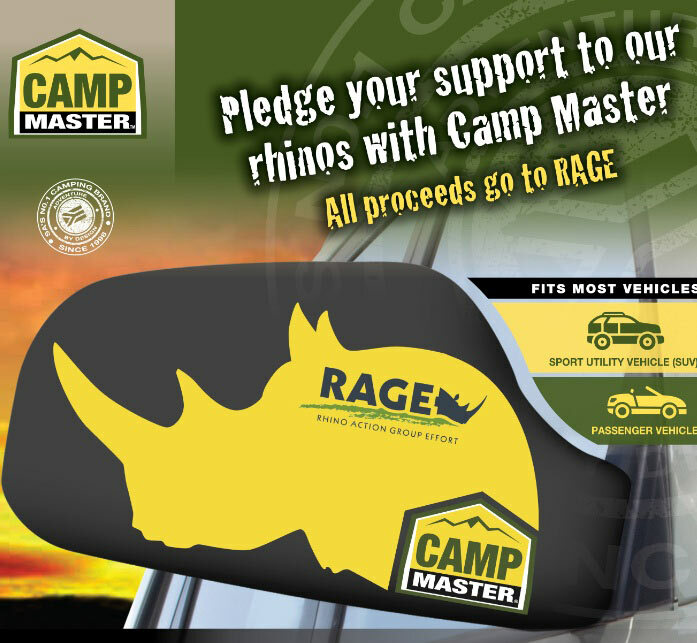 South Africa’s leading outdoor brand, Camp Master has raised a total of R250, 000 for the Rhino Action Group Effort (RAGE) through the sale of vehicle mirror socks at selected Massmart stores. Camp Master matched the contributions from Game, Makro and Builders’ customers to reach a grand total of R250, 000. The cheque was handed to RAGE at Massmart's offices in Sunninghill on Thursday 3 December 2015 to aid its anti-poaching initiatives and help create awareness about the need to combat rhino poaching. RAGE spokesman Andy Rice says: “We are hugely grateful to Camp Master for this large investment in RAGE’s activities – and to its customers for helping to create awareness of the ongoing challenge we face by using the mirror socks on their vehicles. The funds will help to sustain critical RAGE initiatives, with 95% of all funds raised deployed directly for on-the-ground activities. A visit to www.rhinorage.org provides information on all of our campaigns."